Special Nick membership gift - to be mailed at the end of the year! 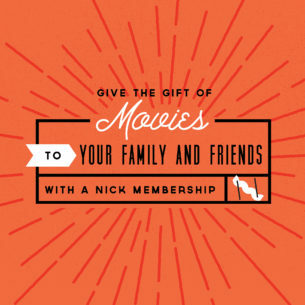 Special Nick membership gift - to be mailed to you at the end of the year! Please present a valid Student ID at the Nickelodeon box office to purchase a Student Membership. Ticket discounts, free popcorn and special access… Nick members get it all. In addition to all of the membership benefits, Nick members benefit most from knowing that their contributions support the Nickelodeon in its effort to bring more great films, engaging conversations, media education programs and filmmaker support services to the Columbia area. Allows members from participating theaters to visit any other participating theater and see a regularly-scheduled film for the basic member discount. For all participating theaters visit the Art House website. Would you like help registering your membership online?